In the last few years, garage doors have experienced a major transformation in their role on the American home. Today’s garage doors do a lot more than go up and down. They deliver style. They can help sell your home in a difficult market. They can save energy and protect your house from powerful winds. They don’t need to be affected by power outages anymore. They can even tell you when you’ve forgotten to close them. Does your garage door do any of that? If your door is 10 years old or older, it probably doesn’t. Want a reason to replace your garage door? 1. Add a unique style to your home’s appearance. Does every home on your street have the same garage door? 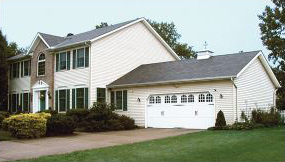 A new carriage house garage door can differentiate your home and greatly increase its curb appeal. Today’s trendy looks range from hundreds of different styles of carriage house doors, contemporary doors and even raised panel doors in unique finishes and colors. 2. Help sell your home. Today’s garage doors offer insulation options that can save energy in both winter and summer. The federal government agrees. In 2006 and 2007, the IRS granted a tax credit to homeowners who replaced their garage door with a qualified insulated door. 4. Protect your home from powerful winds. Hurricanes, tornadoes and strong wind storms can reduce your home to rubble. Wind experts now recognize the critical role played by the garage door in protecting your home from high winds. 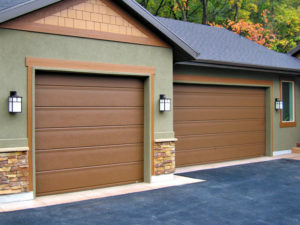 Code-approved, wind-resistant garage doors are now widely available. In many wind-prone areas, these doors are not just helpful; they’re mandated by the building code. The garage door is now used more than the front entry door, according to the 2007 Perfect Home Survey. Since most doors are now automated, how will you get in your home during a power outage? Thanks to garage door opener battery backup systems, your door can keep operating even when power is gone. 6. Tell you when you’ve left it open. An open garage, especially at night, is an invitation to thieves and vandals. Today’s garage door openers offer in-house monitors that alert you when you’ve left your door open – a security tool that provides peace-of-mind. 7. Operate at the touch of a fingertip. Exterior keypads are rapidly growing in popularity. The latest keypad models offer fingerprint-recognition technology that eliminates the need to remember codes and offers fast and easy secure access. 8. Replace your front door. A recent nationwide survey of consumers reveals that 71 percent of homeowners use their garage door to enter and exit their home every day. In today’s fast-paced society, the garage door is the new front door for the American home. The garage door is more convenient, and it commands more attention than the front entry door. 9. Reflect your personal style. Are you into a sleek modern look or the quaint charm of yesteryear? Today’s manufacturers are producing hundreds of distinct varieties that were not available 10 years ago. Why settle for a door that looks like every other door on your street? 10. Be installed by a pro. This isn’t a job for the weekend DIYer. It’s a complex and potentially dangerous task. 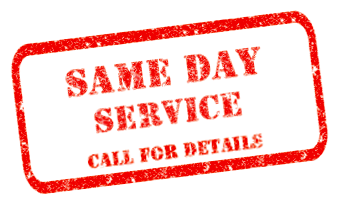 It’s best done by a pro, who can do the job in a few short hours, haul your old door away and make sure your new door and opener are operating properly. When was the last time that you really looked at the outside of your home closely? How does it look from the street as you drive by? Are the shrubs overgrown? Does the paint need retouching? Are there lights to welcome you on a gray day or at night? Does your garage door look like it was from another century? Is your front door hidden from sight? Is your driveway in poor repair? The answers to these questions can help your determine the curb appeal of your home. Simply defined, curb appeal is the first impression the house makes from the outside. It is a term that real estate agentsuse frequently when helping homeowners who are about to sell their home. Because many house-hunters do make up their minds about a house before they even enter it, realtors do emphasize the importance of a home’s exterior appearance. However, if you have no plans to sell your house in the near future, then why bother with curb appeal? Do an inventory of exterior impressions anyway. Make the changes so you can have a sense of pride, and you can enjoy the appearance of your home as you drive into it. If you want to change the message your home is sending, improving its curb appeal is a great place to start, says the National Association of the Remodeling Industry (NARI ). This process starts with your slowly driving through your own neighborhood or one that you admire. Look carefully at the other homes. What catches your eye? Which of these homes stand out? Write down the details of what you like in a particular home. Even snap a picture of outstanding ideas with your camera phone. Now, take a long, hard look at your own home. Look at it with clear eyes. Take a picture and compare it with the others. Make a list of things you would need to do to get your home to the level of the best homes. Set aside budget and time for improving your home’s exterior. It’s time to replace, repair or renew! The most noticeable architectural element of today’s home is the garage door. Many houses are designed with garages that are visible from the street. If the garage holds two or more cars, then it is a dominant feature. What does yours look like? Replacing an old, worn-out garage door with the latest carriage house-style door can totally change the look of your home. In fact, this can do almost more than any other improvement to dress-up the exterior – especially one with a frontfacing garage. And replacing your garage door with a new upscale model may even boost the resale value of your home. A recent online survey revealed that a whopping 71% of homeowners who recently replaced their garage door believe it definitely increased the value of their home. This is a project that needs professional assistance. The good news is the replacement job takes less than half a day to complete, and the installer hauls away the old garage door for you. If you have not been in the market for a garage door, then you have a surprise coming to you. Today’s garage doors are better insulated and stronger as well as safer. And there is an amazing range of styles, colors and new materials from which to choose – wood, steel, fiberglass, or even molded plastic. Take time to learn the advantages of each material. Even the window treatments on these doors have been redesigned to match your own window style. Most architects or designers would advise that you begin your choice of garage doors by considering the style of your home. The new door should complement the architecture of the house, not confuse it. For example, a carriage housestyle garage door might look out of place on a fairly contemporary house. Determine if you want your new door to look outstanding or simply blend in with the other exterior details. 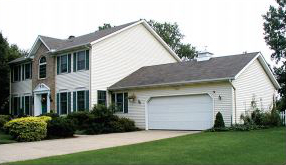 The color of your garage door should complement the overall house color as well as the window trim colors. Some models are available in a limited range while other manufacturers offer custom colors as well. Weather plays an important part in determining which door is right for you. If your location is subject to hurricanes or violent storms, then wind resistance and impact resistance are essential to consider. And in the northern as well as southern climates, an insulated garage door will add to the energy efficiency of your home as a bonus. Renew the color of your home by painting or power-washing your house’s siding. If your home blends in with the neighbors, change the color slightly to make it more outstanding. If the colors are predetermined, then think about adding some decorative molding so you can introduce another complementary color. Sometimes re-painting the trim of the windows or shutters with a contrasting color will add to the visual appeal. Revise your exterior night appearance by changing those out-of-date light fixtures or add lights if you do not have them. Light up your doorways and walkways as well. The idea is to have more lights at a lower wattage than a single very bright light. If your front yard seems gloomy, then consider some landscape lights as well. This will transform the look of your property at night without making it look like Hollywood. This can be done simply with solar-powered lights so you do not have to run wires in the yard. Rethink your landscape. If your shrubs and trees have become overgrown over time, then prune or remove them. Do not let them hide your house or make it appear dark. Rake up dead leaves, pull those weeds and spread mulch in the plant beds. How you maintain your front garden is one of the key aspects of curb appeal. To add instant color, plant some annual flowers that work with the color scheme of your home. Ask at the garden center about shade- or sun-loving varieties, if you are unsure. Place some in the ground and others in containers on your steps or by your front door if space permits. Remember to water them so they always look fresh and inviting. Resurface your old driveway, whether it is made of gravel, tarred or cement, especially if it needs repair. There are many choices of patterned concrete or even woven stone that can improve the appearance of your entrance. Then think about the walkway or path going to the house at the same time. They should present a welcoming effect. Redecorate your house’s street exposure with shutters on the windows or a fresh coat of paint on the front door. Polish or replace the door’s hardware. Even think about adding attractive house numbers or a striking new mailbox. Do not forget to clean those windows as well as the garage windows so they are sparkling. These are smaller changes but they can make your home look inviting and eye-catching. The idea of getting the most out of the curb appeal of your home begins with refreshing the look of your home and front garden. Most of these updating ideas are simple yet subtle alterations that have minimum cost and maximum impact. WHAT’S NEW IN GARAGE DOORS? Here’s a quick test for your decorating sense: walk outside your house directly toward the curb. Now stop and turn around. What’s the first thing you see? Chances are pretty good it’s a massive, hulking garage door. So ask yourself this question: is that thing helping the look of my house, or hurting it? It may be doing neither – it’s just a big, generic rectangle that eats up a third or more of your front façade. Today, there are new ways to make a design statement with your garage door that will kick-start your home’s curb appeal and could even add to its market value. That’s cash back in your pocket, according to a nationwide survey of real estate agents as conducted by Stratamark Research. When real estate agents were shown “before” and “after” snaps of houses that upgraded with new, stylish garage doors, they increased the list price of the home anywhere from 1 to 4 percent. That means a $2,000+ investment in a garage door could increase the sale value of your home by as much as $7,000 if you’re selling a $175,000 home. That gaping hole in the front of your house represents a huge design opportunity. Your local garage door dealer can set you up with stylish new energy-efficient garage doors that accent and flatter the good looks of your house. Better yet, a distinctive new door will make your house stand out from all your neighbors’ homes that sport an old humdrum garage door design. Carriage doors are the hot new trend. They roll up just like your old door, but they fool the eye by echoing the hinged, swing-out door style and charm of old-time carriage houses. New carriage house garage doors are available in real wood that you can leave natural or customize with the colors of your home. Steel or vinyl-clad carriage doors offer a high-style but low-maintenance choice. But the style doesn’t stop there. You can let the light in with gorgeous glass windows in dozens of designer styles. Add the look of wrought-iron decorative hardware for a distinctive period look. The result is a spectacular makeover. If your home’s style doesn’t fit the traditional look of carriage house doors, a wide variety of contemporary designs are now available that can make your home the envy of the neighborhood. A door that combines glass and aluminum, for example, creates a new look that is as much at home in San Francisco as in the Far East. If your home has a Mediterranean or southern European look, you might consider garage doors that have the look of French doors. They appear to swing outward, but feature the hinged-panel operation of a traditional garage door. Opaque glass adds to the elegance of these classically styled doors. Fancy yourself a designer? Do you have a one-of-a-kind home that cries out for a one-of-a-kind garage door? Some garage door manufacturers will work with you to design your own custom creation. It may not be the most inexpensive way to go, but it combines correct engineering with your own design flair for a door that will make you proud every time you pull in the garage. But be sure to have a professional install any garage door. The counterbalance system on these doors is under high tension. Even an experienced do-it-yourselfer can get injured or killed – yes, killed – by making a slight mistake during installation. A professional can install your door for you, quickly and safely, and haul away your old door. The cost of installation is well worth it. Whether you live on the coast, inland, or in the heartland, your home needs to stand up to extreme winds. Storm damage experts testify that your garage door is your home’s first line of defense against strong winds. During hurricanes, for example, houses with an attached garage can literally blow apart if they’re outfitted with flimsy garage doors. Older doors can blast in first, and that lets pressure build up in your house, which can blow the roof off and destroy your life’s investment. But here’s the good news. Ever since the 1992 Hurricane Andrew, all major garage door manufacturers have been designing and producing doors that meet or exceed the most stringent building codes. Some garage doors now can withstand sustained hurricane-force winds of up to 145 mph. New, heavy-duty garage doors. Fabulous styles, finishes and hardware. New garage doors make it easy to makeover your home so it stands apart from all the other houses in your neighborhood. It’s money well-spent, because it’s one of few investments that can pay for itself by increasing the perceived value of your home. It goes up, it goes down. But a new garage door can do a lot more. A whole lot more. … Can increase the value of your home. An online survey says that 71% of homeowners who recently replaced their garage door believe it increased the value of their home. When real estate agents were shown “before” and “after” snaps of houses that upgraded with new, stylish garage doors, they increased the list price of the home anywhere from 1 to 4 percent. That means a $2,000+ investment in a garage door could increase the sale value of your home by as much as $7,000 if you’re selling a $175,000 home. … Can be a chic fashion statement. … Can protect against powerful winds. Reinforced garage doors are now available to help your home stand up to brutal winds. Researchers studying the wind effects of devastating storms know that garage doors are often the entry point for severe damage. A new, strong garage door is an integral part of maintaining the structural integrity of your home. Photoelectric eyes – mounted about six inches above the floor – cast an invisible beam across the door opening and provide extra protection against entrapment. If a door is closing and a child or pet runs underneath the door, the beam would break, causing the door to automatically reverse. … Can keep your house cleaner. … Can open even during power outages. … Can express your individuality. Housing developments have their advantages, but individuality usually isn’t one of them. Choose a fashionable contemporary or carriage house garage door, and your house instantly stands out from the crowd in your neighborhood. … Can help accessorize your life. Garage door opener accessories abound. Many new garage door openers switch on lights in your home as you’re pulling up the driveway. Some alert you if you left the garage door open. You can even make a fashion statement with your garage door remote by customizing it to match your car’s interior. … Can go up in a snap when installed by a professional. Don’t try to install the door yourself. It’s a complex and dangerous task. Be sure to have a professional install any garage door. They can do the job in just a few hours and haul the old door away. The cost of installation is well worth it. … Really IS the new front door. A nationwide survey of consumers said that 71 percent of homeowners use their garage door openers to get into their homes every day. The key to the front door is now the garage door’s remote control and keypad. Latchkey kids? Today, they’re keypad kids. WHAT’S NEW IN GARAGE DOOR OPENERS? Your automatic garage door opener works just fine, you say. It’s opened and closed your door reliably for years. all you’ve needed to do is change the light bulb or the battery in the remote control once in a while. Replace it? What more could you want? What could be new in garage door openers? If your opener was installed prior to 1993, you may be missing out on a great safety feature that is now required on all U.s. and canadian openers manufactured since that time – photoelectric eyes or some other device that provides equivalent protection against entrapment. Photoelectric eyes – mounted about six inches above the floor – cast an invisible beam across the door opening. If a door is closing and, for example, a child or pet were running underneath the door, they would “break” the beam, causing the door to automatically reverse. Your local professional door dealer can help you choose the system that makes sense for your needs – and he or she is also fully trained to install and test the system for optimum performance and safe operation. Many folks don’t carry a house key anymore. Why? Many find it easier to enter their homes through the garage door, using a remote control or an external keypad. these devices have become the new “house keys” for many homeowners. These keypads are especially popular with “latchkey kids” – kids who come home to an empty house. Millions of children come home every day and enter their homes using an exterior garage door keypad. in fact, one survey shows that 33 percent of parents whose homes have external keypads say that the keypad is the number one way for children to enter the homes. “Latchkey kids are now keypad kids,” said chris long, editor of door & operator industry, an industry magazine. The new fingerprint-activated keyless entry pads have created a whole new level of convenience. now, you don’t even need to memorize an entry code. convenience is literally at your fingertip. Entrapment protection and keypads are great, you may say – but how do we open and close the garage door when a storm rolls through and knocks out the power? Today’s openers won’t keep you waiting outside in the rain, or force you to manually disengage the opener and lift the door by hand. a popular accessory sold with new openers is a battery back-up system that allows you to use your garage door opener 24/7, regardless of any loss of power to your home. Speaking of power, chances are you have a surge protector in your home to safeguard your computer from voltage spikes. Surge protectors are also available to shield your garage door opener as well, keeping your door operating system running and protecting your investment. Tt’s probably available. garage door opener accessories abound. Would you like your garage door opener to switch on lights in your home as you’re pulling up the driveway? or alert you if you left the garage door open? it’s all now possible with new garage door accessories. You can even make a fashion statement with your garage door remote by customizing it to match your car’s interior. Beautiful homes. They’re everywhere. On TV, flawless façades get primetime coverage every night. Clean-cut lawns, pristine porches and shining windows bombard your senses. Their perfect features seem to remind you of all the updates you mean to make to your home. Not everyone has the time to keep their home in perfect condition. With work, family and a million-and-one other duties, it’s no surprise that “landscaping chores” and “exterior maintenance” fall to the bottom of your to-do list. In today’s fast-paced world, it’s hard to keep a home in tip-top shape. So what can you do to help improve your home’s curb appeal, be the envy of all your neighbors, and still have time (and energy) to go about your daily life? 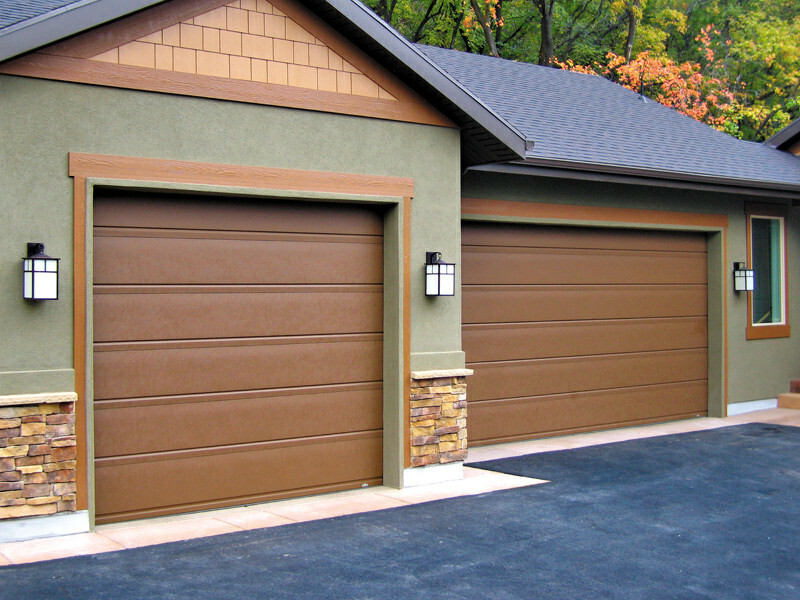 Well, if you’ve got a front-facing attached garage, here’s a simple quick fix – install a new stylish garage door. Don’t worry; you don’t have to actually lift a finger during the installation or do any of the grunt work yourself. You don’t have to perform the installation, nor should you! Garage doors are large and extremely heavy. Installing a new garage door is a difficult and dangerous task that should be left to an experienced professional. A new garage door really can make your home the envy of all your neighbors. Think about it. If your house has an attached garage, the garage door may take up more than one-third of your home’s front façade. If that home is more than five years old, your garage door probably is a solid-colored, raised-panel door that looks like every other garage door in the neighborhood. A new door, quickly, safely and correctly installed by a local professional, will differentiate your home and add style, value and curb appeal. The hottest new style in garage doors is the carriage house design. It’s available in steel, wood or composite materials and in many price ranges. This year, installing a new garage door could even save you up to $500 off your taxes. The U.S. government’s Energy Improvement and Extension Act of 2008 extends tax credits for energy efficient home improvements, including qualifying insulated garage doors. Why not save on taxes and lower your home’s energy consumption while increasing your home’s curb appeal?